Honey is a service dog for US Army Veteran Michael Gaither. This sweet service dog accompanies Michael 24/7 and does not leave his side. Michael is wheelchair bound and needs continued assistance throughout his everyday life. Honey provides that help—if Michael drops something or cannot reach an item, like clothing or food, Honey is able to fetch for Michael. If Michael were to fall, Honey can immediately open a door to find help. Honey can even call 911, if necessary. Honey has been honored by the Governor of Florida, Chiefland City Commissioners, and Levy County Commissioners. Honey is also certified full mobility, P.T.S.D. 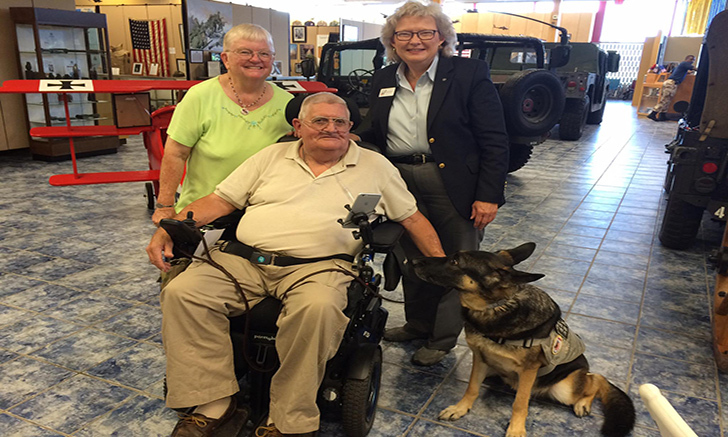 Click here to learn more about the US Army Veteran Service Dog VA Research Project.